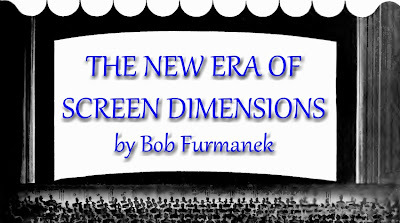 A WIDESCREEN EDUCATION --- A lot of you already know Bob Furmanek as a leading authority on 3-D and widescreen processes as were introduced during the late silent/early talk era and later when Hollywood met onrush of TV with expanded ratios. I've long relied on Bob and his researching associate Jack Theakston to answer Greenbriar inquiry on finer 50's points. They were the two who demolished the myth of Hondo as a 3-D flop withdrawn after single-digit playdates. It's Furmanek we can thank for The Creature From The Black Lagoon done Blu-Ray proper at long last after fifty-eight mis-framed years. Yield of Furmanek's study among trade mags and studio correspondence is The New Era Of Screen Dimensions, a lately uploaded addition to his 3-D Archive, which was founded by Bob in 1990 and has since become the resource for all who'd seek to learn more about stereo photography and movies that utilized it. Widescreen overlaps 3-D to extent of both achieving critical mass in 1953, that year when theatre-going amounted to voyage of discovery and amazement. What Furmanek has done is separate truth from legend, giving us facts rather than assumption as to who/what came first in developing expanded projection. His explore of screen dimensions delves beyond a mere three-D's in terms of data unseen till now. Bob knows how these films should be presented and distributors might well be guided by expertise he brings to frequent updates of a rich online archive. There is also Furmanek's ongoing participation at the Home Theatre Forum where he is resident expert on matters of Aspect Ratio. Over a past year, he has shared bounty of research on all aspects of screen width, honing in specifically on areas I'm much engaged by, namely Hammer Films (when did they begin composing for wide? ), and many US pics that should be available beyond 1.33, but unfortunately aren't as yet. 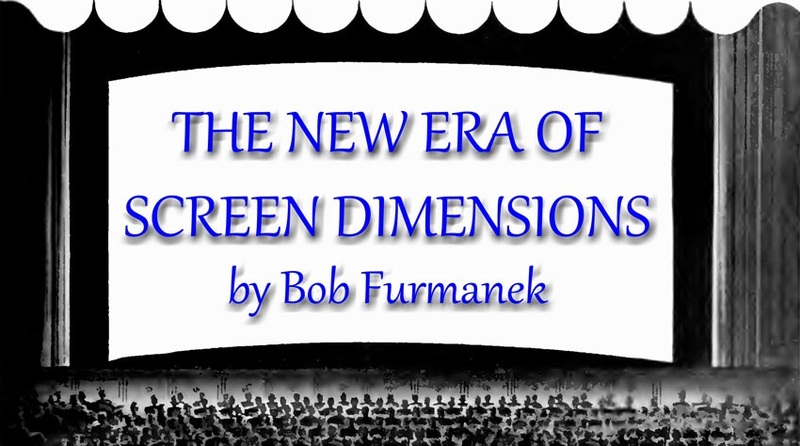 Greenbriar strongly recommends long perusal of what Furmanek has achieved at his Widescreen address, it being a valued and ongoing resource for those who love film and wish to see it properly presented. A RATHBONE REVELATION --- Sometimes career profiles come along that make me want to climb rooftops and shout, You All Must Read This! Such a one was lately writ by Eddie Selover for Bright Lights, a film-centered online publication that I regularly follow. Selover's is a best summary of the Rathbone life and career you're likely to find, supplying detail of beginnings filled with promise that wound sadly toward dead-end of unworthy work in basement-budget exploitation, an odyssey from Shakespeare to Hillbillies In A Haunted House. I remember a friend telling me of meeting Rathbone in a public school where the actor came to do dramatic reading. What made deepest impression was Rathbone's frayed cuffs and agitation over questions one atop the other about Sherlock Holmes. This would have been in the mid-50's when BR was past chance of filmdom recognition beyond heavies to which he'd been consigned, and TV work done in a rush. Maybe he was no worse off than a lot of others, but a lot of us hoped more might come Rathbone's way, even as we enjoyed him best as Holmes or a son of Frankenstein. Selover gets at the tragedy of a great actor who'd not live long enough to realize how a then too-young generation would go on revering him, partial result being writers like Eddie Selover whose sympathetic analysis would have pleased and encouraged Rathbone best of all. Basil deserved the boosts of which he got too few during life, but memory is surely honored by splendid tribute Selover pays here. By all means, go to Bright Lights and read The Strange Case Of Basil Rathbone. TARZAN AND THE VALLEY OF GOLD (1966) --- Mike Henry as Tarzan being James Bond, and what distributing American-International described as a better crime-buster than Batman. Valley Of Gold arrived (June '66) amidst epicenter of a Bat-craze surpassed only by a Bond one. Why not let the venerable Ape Man hook onto both? 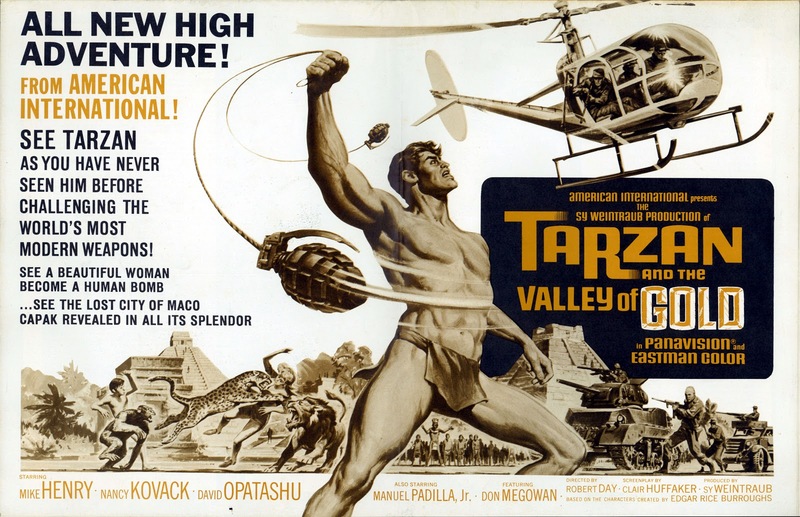 007-borrowing becomes this Tarzan well, Henry introduced alighting from a helicopter in a tanned suit and going about city business with aplomb denied J. Weissmuller in his New York adventure. A near-whole first act has this Tarzan tie-clad and getting particulars of mission at hand while sipping tea. Product placement was never so extravagantly engaged as when Henry rolls a gigantic Coca-Cola prop bottle down stadium stands to off a heavy. It's a memorable scene AIP used in all its trailers/TV spots for Valley Of Gold. 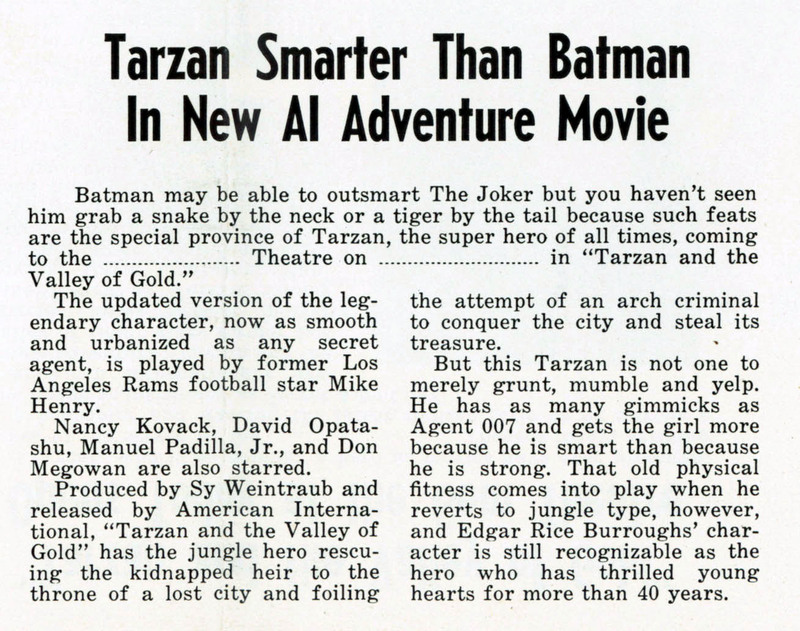 They'd also claim that Tarzan's knife and lion accompaniment was far more efficient at quelling villains than silly gimmicks Batman was heir to. Might Tarzan inspire kids to doff capes, lay down their 007 attaché cases, and return to vine-swinging as in 30's yore? Evidently not, for this Tarzan struck shoals with a mere $609K in domestic rentals for AIP. Producer Sy Weintraub, whose livelihood the Ape Man largely represented, could not have been pleased. His last two Tarzans for Metro release did far better. Had Jim Nicholson and Sam Arkoff dropped the ball, or were we tired of Sy's jungle? (the initial "multi-pix" deal between Weintraub and AIP, signed in 2/66 for US and Canadian handling, would begin and end with Valley Of Gold) Mike Henry had the right chiseled look, and over time, would improve with dialogue, but Valley Of Gold somehow looked cheaper than previous entries. Locations were chosen well, Aztec ruins providing majestic background, and hardly visited onscreen since Gary Cooper and Burt Lancaster rode past them in 1954's Vera Cruz. I passed on Valley Of Gold in '66, but did see its co-feature Frankenstein Conquers The World. This was one of the last kid-friendly bills AIP sent out, ugliness of The Wild Angels and a "protest" cycle dominating Nicholson-Arkoff bills from latter-half 1966 on. 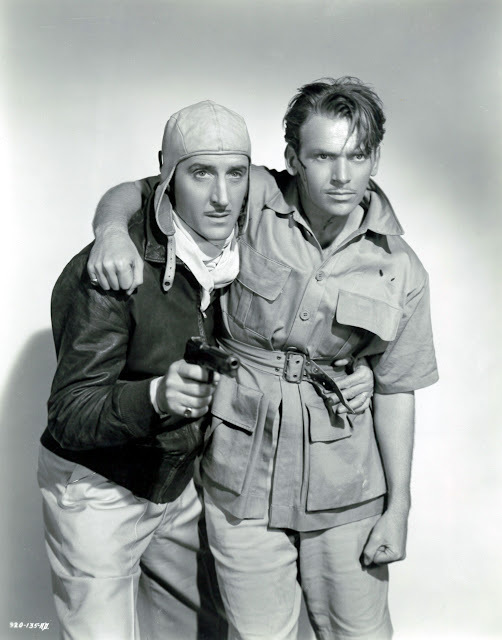 Tarzan and The Valley Of Gold is violent at times after Weintraub fashion he introduced with the (much better) Gordon Scotts. Innocents are mowed down by machine gun fire and Tarzan won't shrink from wholesale killing of henchman armies, being somewhat Connery-ruthless at that and further inviting (favorable) comparison with Bond. Warner Archive has Valley Of Gold in a scope transfer that beat stuffings out of a 16mm pink print collector Mike Cline loaned me to watch thirty-four years ago (come to think of it, he also loaned me this DVD, but let him try getting it back). Students all too often gauge success by all the wrong standards. As one who has been frequently interviewed by students (and who has had friends interviewed by students) I know how often they misread what most see clearly. I am certain Rathbone had shirts without frayed sleeves. Perhaps he was most comfortable in one with them (as I often am. My favorite sweater I bought at The Irish shop in Toronto. Unfortunately, moths liked it, too). Alec Guiness' hated kids who loved him for his connection to STAR WARS. Thank you very much, John! Your kindness is certainly appreciated. To answer your question, Hammer/Exclusive went wide on June 29, 1953 with production of THE BLACK GLOVE/FACE THE MUSIC in the unusual ratio of 1.8. They later switched to the early UK standard of 1.65:1 for HEAT WAVE/THE HOUSE ACROSS THE LAKE, FAMILY AFFAIR/LIFE WITH THE LYONS and BLACKOUT/MURDER BY PROXY. By the time cameras rolled on January 23, 1956 for X THE UNKNOWN, they were composing for the newly established UK standard of 1.75:1. I'm currently doing research into the whole UK widescreen conversion which happened June through December 1953. Ealing's first was WEST OF ZANZIBAR and I expect to have the rest documented in the next few weeks. I wonder how many other L.A. Rams attempted an acting career besides Mike Henry? Off the top of my head, I can think of Elroy "Crazy Legs" Hirsch, Merlin Olsen, Rosey Grier and Fred Dryer. 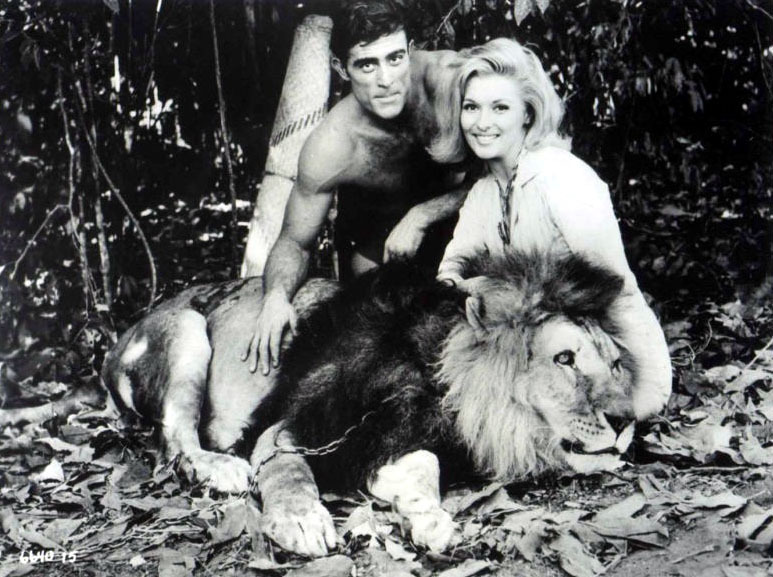 Sy Weintraub also produced the Tarzan TV series with Ron Ely. Well, my brother and I did contribute to the meager box office take of TARZAN AND THE VALLEY OF GOLD. Caught it on that very same double feature package back in '66. I'm sure we didn't understand the modern concept of guilty pleasure (hell, we were dumb kids... 99.9% of all our pleasures were totally guilt free!) We both thought the sight of Tarzan ripping off his suit and skinny tie as well as a 200 foot foot tall Frankenstein monster (also skinny) were pretty cool! Is that Leo White from Chaplin's ESSANEYS in the top photo? He plays a waiter named Leo in THE THIN MAN. Wonder if he's called Leo in that picture. The film is "The Masked Bride" with Rathbone and Mae Murray. Leo White is listed among the cast in the role of "floor manager," so I'd say this is indeed him. 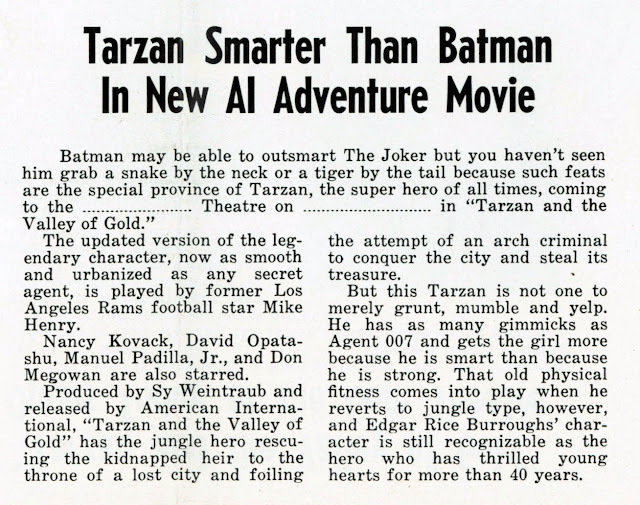 I recall seeing 'Tarzan And The Valley Of Gold' on a triple-feature in 1966 with 'Frankenstein Conquers The World' and Elvis Presley in Paradise, Hawaiian Style'. Mike Henry really looked and acted like the old Dell Comics Tarzan as drawn by Jesse Marsh. On top of that Nancy Kovack was a dish and the film had a brilliant performance by David Opatoshu as a greedy villian. The other, Frankenstein actually starred Nick Adams who traveled to Japan to make three sci-fi films out of hunger. The best was Frankenstein which like the Tarzan film holds up as a guilty pleasure today. On the Elvis Presley film, I remember breath-taking Hawaiian scenery and a bevy of gorgeous-looking girls surrounding the King!